Apart from a few simple ingredients all you need to make sorbet is an ice cream maker and a freezer. It is well worth having a go . . . you will not be disappointed by the results! Sorbet is the French equivalent of the British water ice. It is a semi-frozen sugar syrup, which has a soft texture and is made from fruit juice or purée. You can also make it with infusions made from such things as mint, tea, coffee or liqueurs. Sorbets have developed over the years into a popular iced dessert but the earlier use was as a palate cleanser between courses. Having said that, savoury sorbets are becoming increasingly popular in top restaurants, been served between courses, again as a palate cleanser. Sorbet is the French word for these frozen desserts and derives from the Italian word sorbetto. The dessert did not originate in Italy but came from the Arabs, who learned about it from the Persians, who learned about it from the Chinese. The first sorbets were made from honey, aromatics, fruit and snow. 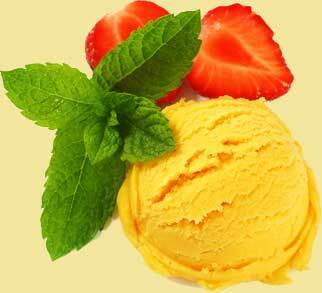 Sorbets first appeared in Europe in the latter part of the Seventeenth century. In France, a sorbet might have been served as an iced drink in the same way that a sherbet would be in the Middle East. Granita is also a sorbet and is very much an Italian version. Granita is not made by churning it in an ice cream maker but by roughly mixing it with a fork as it freezes, so that it consists of larger ice crystals with a rougher texture making it crunchier than sorbet when eaten. The following recipes are just to give you some idea as to the different sorbets that you can make. Purée the blackcurrants and basil, set aside. Gently boil the honey, zest, juice, sugar and water for 10 minutes, cool. Pour into a flat tray and freeze. Break into pieces and quickly process. Fold in stiffly beaten egg whites and freeze. Berries of any kind can be used in place of blackcurrants. Infuse tea with water for five minutes, strain. Mix in sugar, juices and julienne of lemon zest. Cool and strain, blend in beaten egg whites. Place in ice cream machine. Remove rind from lemons with a zester and juice. Strain juice from the tinned lychees. Pureé enough of the lychees in a blender and pass through a strainer to make up 600 ml of liquid (the remaining lychees reserve for garnishing). Infuse the tea bags in 1.2 lt of water for ten minutes. Dissolve the sugar in the tea, add the lemon juice and rind and simmer for 5 minutes, place in the chiller to cool. Mix in the lychee juice and pour into a shallow tray(s), cover and freeze for 2 hours until half frozen and slushy. Beat the half frozen pureé to break down the ice crystals. Gladwrap and freeze for a further 3 hours until firm. Transfer to chiller 20 minutes before required to soften up. Place over a medium heat and simmer gently for 10 minutes to melt chocolate and infuse all flavours. Remove vanilla bean and scrape seeds into milk. Place into ice cream machine. Place peppers on a baking sheet and roast at 200°C for 25 - 30 minutes or until flesh is soft. Place in a bag or bowl and seal for 10 minutes and then peel skins, remove seeds and set aside. Place the shallots, water and sugar in a small saucepan, bring to a boil, reduce heat and simmer on low for 5 minutes. Remove from heat, cool, then place red pepper mixture, thyme, salt and Tabasco in a food processor or blender and mix until smooth. Place into an ice cream machine until frozen. Combine all the ingredients and puree in a blender. Freeze in an ice cream machine. Enjoy your sorbets and bon appetit . . . . .